Despite those early cinematics , Dead Island has never taxed anyone reluctant to use their brains. Dead Island 2 appears to be following a similar course, except this time there's nothing subliminal about the messaging, which appears to be: "you get to kill zombies". The trailer showcases the manner in which you kill them, and the results are gory. Dead Island 2, which is no longer set on an island but instead Hollywood, is due to release in early 2015. According to Samuel Roberts' early preview the game boasts eight player coop and a "cheekier tone" than before. This installment is in development at Yager, which is better known for the rather thoughtful Spec Ops: The Line. 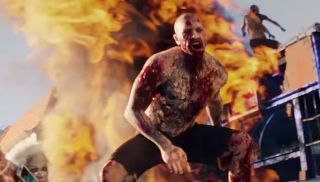 Meanwhile, veteran Dead Island studio Techland is working on Dying Light , another zombie game. Because you know, zombies.